Casino Royale (2006) is the first of the Daniel Craig Bond movies, and sees an African warlord, Steven Obanno, employ Le Chiffre (a short-selling, terror financing, accountant with a weepy eye) to look after a large sum of money with 'no risk' - i.e. what we normal folk call money laundering. Le Chiffre uses the funds to but put-options in an aerospace company called Skyfleet. Essentially, he bets on the company's failure. And for good reason. He's got plans to blow up Skyfleet's airliner and force the share price down (which will make him loads of money because of the put options). But Mr Bond steps in and in a crazy chase / shootout / Bond running stiffly sequence, manages to stop the destruction of the plane. Of course, this makes Le Chiffre rather upset because he loses the massive sum of money he was supposed to be looking after for Obanno, the terrorist warlord. Not smart Le Chiffre. Not smart. 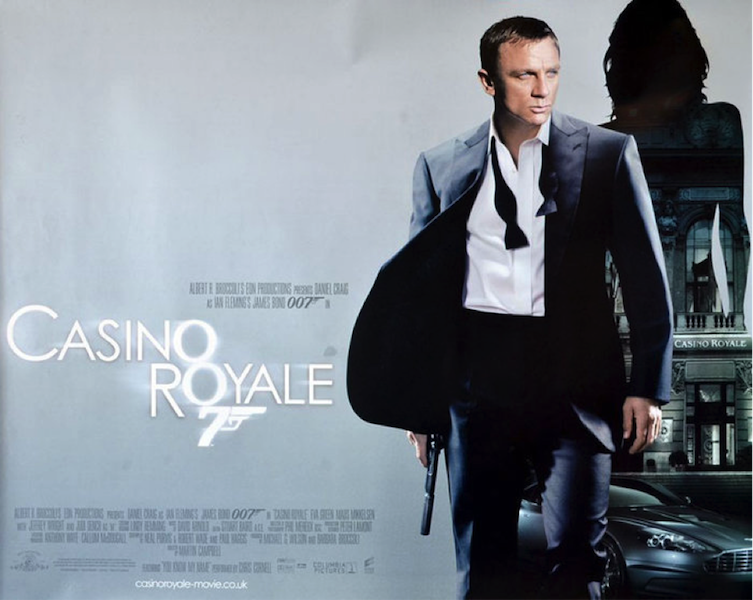 So, in an attempt to recoup the money, he sets up a high-stakes game of poker at the Casino Royale to try and win the money back. Bond manages to convince the powers that be to stump up the the $10 million buy-in, and attempt to thwart the whole plan. Source: Where is the Nomad? "I'm sorry. That last hand....nearly killed me." As you can expect from Bond, it becomes the most exciting and dangerous games of poker you've ever seen. So who wins, and what happens to the money? Well, you'll have to watch to find out. but some sensational stunt work and a core seriousness." Fun Fact: Richard Branson, founder of Virgin airlines, makes a cameo in the movie. Apparently British Airways have a severe case of competitive nerves, because they removed the Branson scene from the in-flight version of the movie (as well as a fleeting shot of the tail of a Virgin aircraft). Put Options: an option to sell assets at an agreed price on or before a particular date. Short Selling: short selling is the practice of selling securities or other financial instruments that are not currently owned, and subsequently repurchasing them. Risk: Put-options (or trying to be sneaky with a warlord) are not low risk. Sometimes Bond movies can be a bit far-fetched, but there's a bit or art imitating life in this film. Prior to the September 11 attacks, there was some suspicion that terrorist organisations were short-selling airline stocks. But regardless of the money stuff, the action in this one is lots of fun.